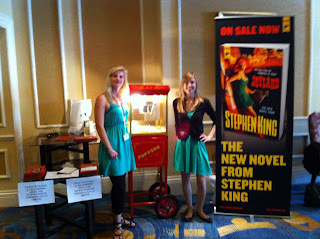 During the Crimefest weekend, Titan Publishing were hard at work getting their promotional Popcorn Machine working to launch Stephen King’s JOYLAND, which is from their imprint, Charles Ardai’s Hard Case Crime. From the writer of The Ghost series of novels and audio scripts for the BBC’s Doctor Who and Sherlock Holmes, comes the fourth instalment of George Mann’s popular Newbury & Hobbes series of steampunk mysteries, The Executioner’s Heart [Titan Books, July 2013, Original Paperback]. The Executioner’s Heart is the latest adventure of Sir Maurice Newbury, gentleman investigator for the Crown, and his feisty assistant Miss Veronica Hobbes! George Mann is the author of the Newbury and Hobbes and The Ghost series of novels, as well as numerous short stories, novellas and audiobooks. He has written fiction and audio scripts for the BBC’s Doctor Who and Sherlock Holmes. He is also a respected anthologist and has edited The Solaris Book of New Science Fiction, The Solaris Book of New Fantasy, and Titan Books’ Encounters of Sherlock Holmes. He lives near Grantham, UK.